Endeavour EHS exists to provide our clients with real world solutions to real world problems. Founded in 2007, the goal of Endeavour’s founder, Dave Einolf, was to provide clients with an option to ?one size fits all? EHS consulting. Endeavour aims to provide individual services to our clients ? meeting their business objectives in a cost-effective manner, while providing them exceptional service. Endeavour prefers to work as a member of our client’s EHS staff, interacting directly with senior management on EHS business issues. Endeavour has taken assignments that include acting as in-house EHS director and EHS staff for clients who do not need full-time resources. Endeavour has worked with clients to direct compliance audit and due diligence projects where internal resources are not available to meet the needs. Located in Portland, Oregon, Endeavour provides a virtual service to our clients, providing on-site assistance throughout the US on an as-needed basis. Endeavour’s staff has completed project work in each of the 50 U.S. states, Canada, Mexico, as well as more than 20 other countries. Through our network of subcontracting relationships, Endeavour is able to provide rapid service to clients throughout the world. The Endeavour logo is representative of our Pacific Northwest heritage. It is a Tsimshian form-line drawing which represents a killer whale. The elements of the whale have been fashioned into a circular emblem that may have been used on a drum head. We have identified this image in various trade goods sold throughout Alaska. 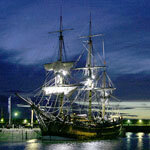 HM Bark Endeavour sailed from Plymouth, England in 1768 carrying Captain James T. Cook on one of the most famous voyages of discovery in history. Cook’s resilience in the face of adversity is forever linked with the name Endeavour. 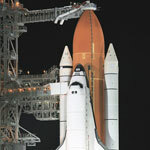 NASA acknowledged that spirit by naming its fifth shuttle Endeavour, launching STS-49, its first mission in 1992.